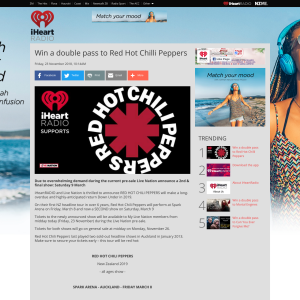 iHeartRADIO and Live Nation is thrilled to announce RED HOT CHILI PEPPERS will make a long-overdue and highly-anticipated return Down Under in 2019. 2. Prizes are for tickets only. Excludes transport and accommodation. 3. One prize per winner. Cannot be exchanged for cash. 4. This competition closes on the 17 February 11.59pm. Winner to be notified via phone. 5. Only entrants who have downloaded the 'iHeartRadio app' and have logged in to the app will be eligible to win. Entries will be matched by email address on the competition entry, to the email address associated with the customer's iHeartRadio account.